FriendFreak, a $1 iPhone app with a free lite version also available, quizzes you on your Facebook friends. The game functions well enough, but lacks any real replay value: Testing your knowledge about your friends gets old after about two minutes. Friend Finder: FriendFreak quizzes you on just how well you know your Facebook friends, rewarding you for speedy and accurate responses. Using Facebook Connect, you grant FriendFreak the rights to look at all your friends. TopDownApp’s game can then quiz you on your pals in a variety of ways, each with the same basic approach. For example, when you’re being quizzed on simply recognizing your buddies’ names, you’ll see four photos from your friends list, and one name displayed. You need to drag the right photo onto the name. You’re rewarded for speed and accuracy, and aim for ever higher scores. 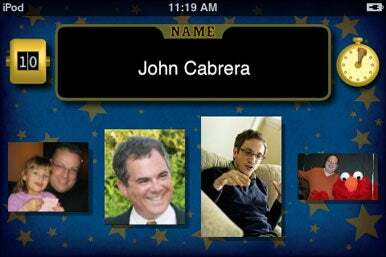 In the free version, you’re only quizzed on your friends names and preferred music styles. The paid version offers many more categories, but good luck with them. Maybe I’m a bad friend, but you show me four of my pals and a birthdate, and I’ve barely got better than a 25 percent shot at figuring out whose birthday it is. And since some of my friends—and probably yours, too—use pictures of monkeys, cartoons, or random icons as their Facebook picture, it’s sometimes tough to identify the right answer even when you know it. Even more annoyingly, FriendFreak doesn’t seem to notice when friends don’t have photos; it’s extra frustrating to drag “blank space” to identify your friends. FriendFreak is cute to play, briefly. But there’s limited appeal in testing myself on my friends’ favorite books, political beliefs, or relationship status. FriendFreak is compatible with any iPhone or iPod touch running the iPhone 2.x software update.